Custom-made segmented single-sample design. 0.875” in diameter. 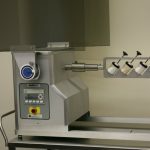 Facilitates sampling from large blenders, with roof height limitation. Both segments may be used independently. Has a 1.5” diameter nut to join the segments. The bottom most port starts at 1.5” from the tip. Same dies as described under Model I fit in this sampler.